Bugger! So we’ve all heard that Mzungu twanged his knee. After scans the verdict isn’t too bad. But he will not be starting in our Dream Teams in round 1. So what’s next? The scans have been done and the most selected player in our Dream Teams for 2011 will be out for approx 2 months. Mzungu injured his left knee in a marking contest halfway through the first quarter on Saturday and damaged his medial ligament with a touch of bone bruising in there as well. There was no damage to his ACL and Mzungu should be a perfect down grade target in about round 8 once we have fattened up some of our cash cows. The good news is… Nick Lower, a former Port Adelaide player is set to be upgraded on to the senior list before Tuesday’s deadline. Lower is 23 years old and started the match in the centre square and was once again very impressive. So who will you be replacing Mzungu with? Personally, McKernan (Adel) has currently taken his spot in Team Calvinator, but will most likely chance as my team changes by the minute! Can’t remember who I put in…my team has changed so much in the last 24 hours! Damn. I thought I was the only one who knew about Lower. I’ve had him in my team since I first picked it. Lower is a certainty. 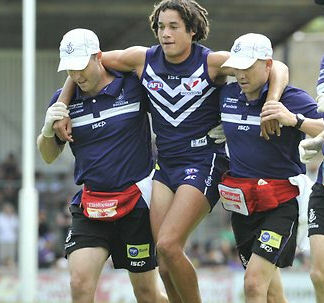 Ex Power and Norwood boy, will get plenty of it for Freo. Was in my team as well, and had my fingers crossed he would be upgraded-not this way though. why not just leave him in on the bench? saves a trade and he will be back in before you know it? thats soooo dum!!! how does it save a trade? You will need to trade a cash cow to get cash right? Around rnd 9-10 (after a couple of WAFL games) he should be right for a downgrade. having him sit there for 10 weeks is a waste of valuable cash cow space on the pine. duhhhhhh! is he out till round ten? i didn’t know that. i will definately get rid of him now, and thankyou all for telling me the same thing in three different ways. i had mzungu in the mids had to swap him with krakour from my forwards to keep my DPP. I had to get rid off Mzungu and plus he was my only fwd/mid in my midfield. Aargh!! Irons is okay, but is he going to get a game? Moved Heppell from Def to Mid and put Lower in the backline. so….. will darling get a game. 8 weeks is too long to keep him. Atley in the midfield: whats his chances of playing alot of footy? Last year I used to many trades early, hoping to use 9 at the most in the first 12 rounds. With Mzungu out I have made a few extra trades! with some cash in the bank, who do you think would be the better player? 1. Deledio or Conners or Broughton? I had Higgins last year and trust me, you do not want to get him because he will take you on a rollercoaster. Morton for me. instead of higgins.. what about jarred grant? averaged 74 in his first season and looks alot better player now..? If you have Riewoldt and Goddard in your team already drop Montagna for Swallow. Morton is not as risky as Higgins, but he won’t average as high as him. Higgins looks fit in the pre-season, so I’ve taken the risk with him. yeah cheers, i have goddard and riewoldt so yeah i recken that is a good call for montagna. yeah, its going to be vital to chose the right time to trade players in and out this year. what a mess at least we will have another downgrade target with callinan. Last week I changed Cracks to the midfield to get smith out of my team all together, i thought there were better options, i then replaced Smith with Astbury in my forward line. Now I have traded mzungu from my forward line, taken prestia from my mids and put him forward, put Astbury in my backline, bought Hibberd into my mids and put smith back into my forward line. I made hard work of that I am now going to wait until the team lists are out and then make the big changes on Thurdsay arvo, why cant GC just play round 1 it would make this so much easier.